Becoming more nutritionally conscious is one of the things that moms-to-be have in common, and prebiotics in pregnancy is one of the issues that are gaining ground when it comes to gestational health. But what are prebiotics and how do they help ensure a healthy pregnancy and baby? Read on to find out. Because they sound so much alike, prebiotics is often confused with probiotics. But there are significant differences between the two. Probiotics are usually live bacteria that do not occur naturally in food. Instead, they are added to foodstuff such as probiotic supplements or yogurt. Prebiotics, on the other hand, are naturally found in vegetables and fruits such as kiwis, oranges, and artichokes. How are these fruits and vegetables characterized as prebiotics? It is because they contain a dietary fiber called soluble fiber. Now, it is common knowledge that fiber is essential in proper digestion. However, soluble fiber goes beyond mere digestion; it is a vital component in the distribution of nutrients throughout the human body. The fiber in various fruits and vegetables are not dissolved by the stomach’s acids, instead, they move to the large intestine or colon, where they are used as a source of energy by “good” intestinal bacteria. Having a healthy amount of good bacteria in the colon is important since they check the growth of bad bacteria or pathogens that cause illness. There are several digestive discomforts that most of us experience at any time in our lives, and during pregnancy, these conditions may occur more frequently or on a more severe level. These include constipation, bloating, stomach cramps, and upset stomach. Ingesting food or food supplements with a prebiotic effect will go a long way towards alleviating these problems. Pregnant women also know that while they are eating for two, it is not the amount of food that is important, but the nutritional content. Studies have shown that good maternal health is vital in the baby’s growth and development in the womb. Therefore, prebiotics in pregnancy is good not only for the mother, but for her baby as well. Obstetricians, gynecologists, nutritionists and other health experts recommend that pregnant women get the optimal amounts of nutrition in their daily food portions. This includes eating more fruits, vegetables and foods rich in omega-3 fatty acids such as fish. However, many times the nutrients in food are lost through freezing or cooking, so a woman might think she is eating good amounts of healthy food for her and her baby when in fact she is not getting enough of the nutrients they both need. Another problem is that much of the nutritional content of vegetables and fruits is found in the skin or rind, and consuming large amounts of this is not always appetizing or possible. 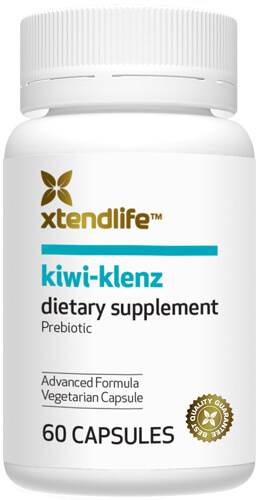 One excellent way of dealing with these obstacles is to take a high-quality food supplement such as Kiwi-Klenz from Xtend-life. This nutritional supplement is made from the kiwi fruit, using all-natural ingredients, with no additives, and processed in such a way that the fruit’s prebiotic strength and effects are not compromised. It is gentle on the stomach and can safely be taken by children and adults, men and women. It is a natural way to realize the benefits of prebiotics in pregnancy for both mother and baby.